We’re delighted to announce that Mary Gompertz has been awarded a 2016 College Award for her outstanding contribution to life at Oxford Sixth Form College. 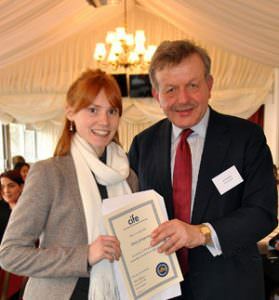 Mary (pictured here receiving her award from CIFE President Lord Lexden) joined OSFC in September 2014. From her first weeks at the college, Mary demonstrated an impressive drive towards academic success as well as real perseverance and talent. It did not take any of Mary’s teachers by surprise that she went on to achieve A*A*A*A*A*A*A* A in her I/GCSEs. Mary has a sharp, mature and insightful intellect beyond her years, which she demonstrated in her overall grades and in some exceptionally high UMS scores. She will always continue to be an inspiration to her teachers.